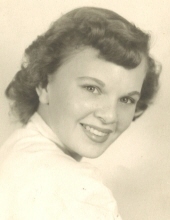 Iva Jean Vinson (nee Porter), passed away February 8, 2019. Beloved wife of Henry. Loving mother of Sherri (Bob - Deceased), Drema (Paul) and Willard (deceased). Loving step-mother of David (deceased), Richard, Carol and Henry (Judy). Loving grandmother. Graveside services will be held on Saturday, February 16, 2019 at 12:00 PM at Forest Lawn Cemetery at Pecks Mill, WV. Friends may call on the family on Friday, February 15, 2019 from 4:00 - 8:00 PM at Honaker Funeral Home in Logan. Honaker Funeral Home of Logan is in charge of the arrangements in WV. To send flowers or a remembrance gift to the family of Iva Jean Vinson, please visit our Tribute Store. "Email Address" would like to share the life celebration of Iva Jean Vinson. Click on the "link" to go to share a favorite memory or leave a condolence message for the family.